COLUMBIA COUNTY, FL – Our Santa Fe Riverfest 2019 is just around the corner. 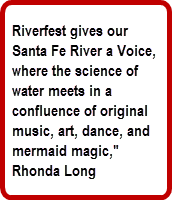 (Sunday, March 31) Riverfest gives our Santa Fe River a Voice, bringing together artists, environmentalists, live music, food, family fun, and people all in support of Columbia County's Santa Fe River. 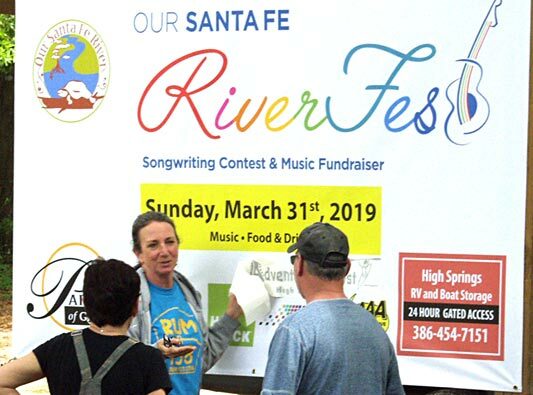 Riverfest 2019 features a live music contest starring 8 original songs written specifically about our very own Florida Outstanding Waterway – the Santa Fe River. There will also be a Silent Auction including the work of many local artists including John Moran nature photography and jeweler Bernie Reller. There will also be fun gift baskets and gift certificates to several local businesses and a treasure of many more surprises. Meet the Official Mermaid of Riverfest 2019, Mermaid Danielle. Family fun activities include face painting, bubble blowing, and a hula hoop and sticky catch game. And that’s not all. Get ready to be thrilled. After the songwriting winners are announced, the Deviljays will take the stage. The Deviljays are an award winning electric Blues quartet hailing from Lake City, Florida. Put on your dancin' shoes and swing to the blues! Our Santa Fe Riverfest 2019 will be held at Rum 138, 2070 SW County Rd 138, Fort White, FL 32038 - call (386)454-4247. The gates & Silent Auction will open Sunday at 1:00 p.m. A variety of food, beverages, beer & wine, including vegan fare, will be provided by Rum 138 and Bambi’s Country Market Cafe during the event. The 9th Annual Singer Songwriters Contest will begin at 2:00 p.m., with the winners announced at 4:00 p.m.
Then, it’s dance time to the Deviljays as the fun continues. The excitement extends as the winners of the Silent Auction are announced shortly after 5:00 p.m. Absolutely, a full day and evening of surprises, learning, and - yes, mermaid magic! All proceeds from this super fun fundraiser directly benefit Our Santa Fe River, a completely volunteer run, not-for-profit organization, dedicated to the education, stewardship, advocacy and activism for the Santa Fe River, Aquifers, and supporting spring sheds. Starting in 2007, the organization began by preventing 4 water bottling plants from being issued permits to pump millions of gallons of water from our fragile springs and aquifer. Visit OurSantaFeRiver.Org, or Facebook page, to learn how you can become involved, or view the organization's goals and achievements regarding phosphate mining, fracking, and river/sinkhole cleanups. Rhonda Long is a member of Board of Directors of Our Santa Fe River, an environmentalist and dedicated outdoors person.